Back in October 2005 the Walt Disney Company had a major change in management when Disney's CEO Michael Eisner left power, and Robert Iger was placed in charge. As a result of the Walt Disney Company's management change, came other major changes in several of the sub-companies and segments of the Walt Disney Company – including the Muppets Holding Company. Just a few days after Eisner was out of the picture, Chris Curtin was released from his duties as the head of the Muppets Holding Company. Shortly after Curtin's departure, Russell Hampton was instated as an Executive Vice President in charge of overseeing the Muppets Holding Company (and The Baby Einstein Company). In addition, as Executive Vice President and General Manager of the Muppets Holding Company, Hampton is responsible for the overall management of the Muppets franchise. In September, just a few days before the management change, Kermit the Frog appeared on Good Morning America. The frog announced to the world that he would be embarking on a big 15-month, 50-stop, 50th-anniversary world tour. The tour kicked off in Kermit, Texas shortly following. However it has now been confirmed that Disney cut the road trip short (with only 3 of the 50 stops completed). Homecoming king, Kermit the Frog, celebrates with the cheerleaders from Kermit High School in Kermit, Texas on October 14, 2005. Kermit also made stops in Houston and New York City. Apparently the new management did not feel that it was an effective or efficient use of their company resources at this time. Adding insult to injury: a Disney source close to the Muppets told TV-Guide that the Disney executives "didn't think the public would notice". Also lost due to the abrupt management change was the planned Christmas special, along with several other proposed and approved projects left from the "Curtin days". Reportedly, Hampton and the other Muppet/Disney executives did not see eye-to-eye on a lot of what Curtin was planning, and another Disney sources states the many of the Disney executives are still skeptical about the potential of the Muppet franchise. 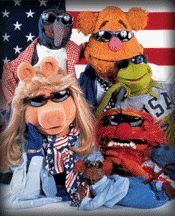 It was stated that the only major Muppet project in the works as of now is the tentative ABC's reality parody "America's Next Muppet". But we've been told that the Muppet Holding Company is working hard to assess the market and re-launch the Muppets (yet again) with other projects as well.